Yea it can be a pain. I've been working on making more brackets and cutting the rods from 5pmm-10pm yesterday, still working on them now too. After you've done this once, the next time is incredibly easier. i re did mine but it wont work..it worked but when i put the door pannel on it stopped...any help guyss?? Sounds like one of the wires got unplugged from the actuator. Remove panel to verify. 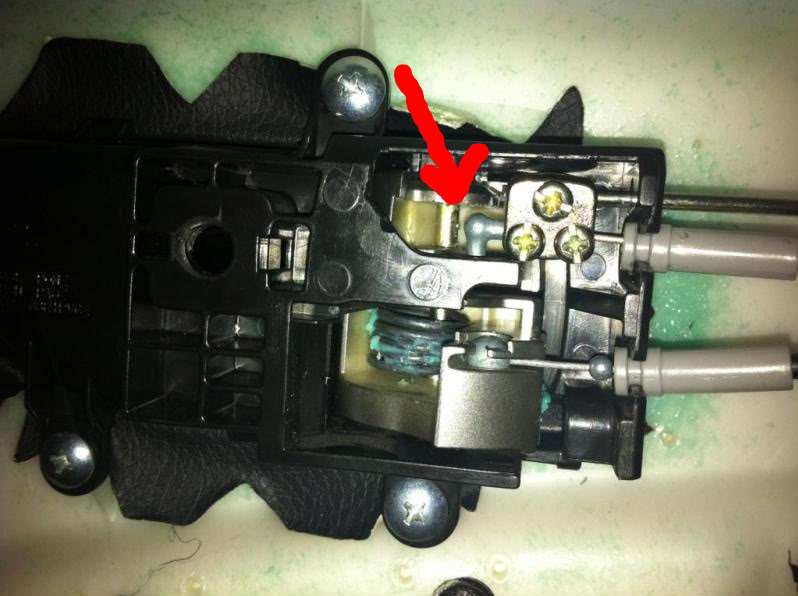 Unless it is making sound, then check the mounting bracket in the interior door handle housing. Post up any issues you have, I've done 30 of these myself. Just run through the process again and see if you find the problem. Finally got a chance to fix my passenger side. Followed pythonjosh's videos and got it done in a snap. Was going to fix my driver's side as well, but the kits that I got shorted me on "speed nuts", so I wouldn't have been able to screw my bracket down to the plastic in the door without them. I was able to use a pair of dikes to cut out most of the tab quickly, then had to drill out a little more to make sure it wouldn't interfere with the rod. I thought I might have trouble getting the cable tied down, but that ended up going well. Will take care of the driver's side in the morning. Thanks again OP and pythonjosh for your instructions! OP is long gone (last activity 2007), but if it wasn't for him or Manny, I probably wouldn't have done this. Never seen or heard of universal actuators until this thread. I actually just got done installing one of these on my gf's sister's ford minivan. Wish I could drum up more business for other makes and models as well. Surprised posting on craigslist didn't turn up any customers. this type of job is hard to drum up on CL; most people don't actually look for specific services to be performed for their vehicle. I was updating people's GPS through a CL posting, and there were some interest, but for the most part people don't follow through. Many thanks to Mannyz33 and PythonJosh for the photos and the videos. 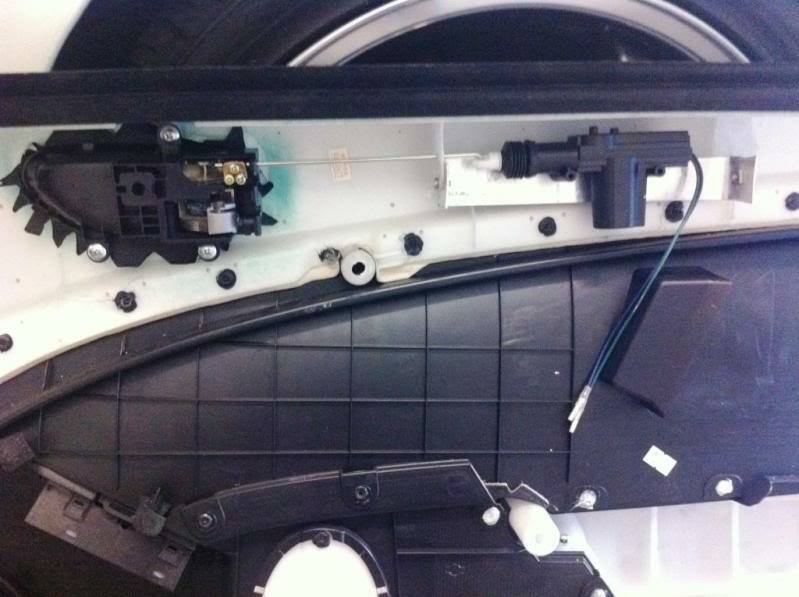 I just performed this installation yesterday on both doors of my G35 2003 coupe and they work beter than the original Renault OEM parts that Nissan snuck in to our Infiniti vehicles... A very nice fix indeed! Well i followed the guide, hooked everything up, made sure lock was lock and unlock was unlock, put it all back together. Tested few times more, worked.. I think the little tab on the lock has come out of the door lock switch and the acuator is not pulling the cable back... MF. Where the red arrow is i believe that has come loose and now i cant manually open the door.. I have NFI why the actuator will also not work..
Last edited by R6n350GT; 01-26-2011 at 03:37 PM.